A panel of state and federal judges discussed the career and legacy of United States Supreme Court Justice Ruth Bader Ginsburg at a recent CLE organized by the Nashville Bar Association in partnership with the Lawyers’ Association for Women. 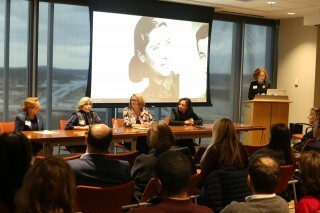 The discussion, held at the Butler Snow law firm in Nashville, was centered on a screening of 2018’s award-winning documentary film “RBG,” which traces Justice Ginsburg’s life and career. Federal Magistrate Judge Alistair E. Newbern posed questions prompted by the film to a panel consisting of Tennessee Supreme Court Justice Cornelia A. Clark, Davidson County Chancellor Anne C. Martin, Tennessee Court of Criminal Appeals Judge Camille R. McMullen, and United States District Court Judge Aleta A. Trauger. The judges offered their thoughts on Justice Ginsburg’s place in American jurisprudence and society, and also talked about their own journeys as women who had risen to prominent roles in the legal system. Much of the discussion arose from Justice Ginsburg’s candid descriptions of the obstacles that she faced as she set out on her legal career. “I became a lawyer in days when women were not wanted by most members of the legal profession,” Ginsburg said in the documentary. At Harvard Law School, Ginsburg was one of just nine women in her class of over 500 students. That fact put added pressure on her in the competitive law school environment. This problem was exacerbated by the unsympathetic attitudes of some at Harvard Law. Justice Ginsburg recalls a dean pointedly asking female students what they were doing taking up spots in law school that could have been occupied by men. Justice Ginsburg graduated from law school in 1959, many years before any of the judges on the panel did; some of the issues that Justice Ginsburg described in the film, though, were unfortunately still pertinent decades later. When Justice Clark started at Vanderbilt University Law School, the number of female students had increased significantly from past years, but women were still a distinct minority. That environment still occasionally produced objectionable statements by people in power concerning women and the legal profession. Justice Clark particularly remembers one teacher who had a demeaning message for female students in a large first-year class one morning. “That was as late as 1976,” Justice Clark said. Judge McMullen’s experience at the University of Tennessee College of Law in the early 1990s was different in some ways, but similar in others. Women made up a large proportion of the student body at the law school by that time, but women of color were still relatively rare. Judge McMullen was one of only three women of color in her class. As she noted, only two of those women, including herself, actually graduated. “In terms of how I viewed my law school experience, it was very isolating,” she said. As the judges moved from law school in to their professional careers, they faced similar headwinds. Both Judge Trauger and Justice Clark remembered how even those law firms that were progressive enough to consider hiring women in the early 1970s still took those potential hires to exclusive men-only luncheon clubs where they would be shuffled into a back room for discussion. These back rooms were colloquially known as “Jane Crow” rooms by the women forced to use them. “It was disconcerting,” Justice Clark said. Judge Trauger confronted a male attorney at one of these clubs one day, asking him why men did not want women in the main dining room. “He said, ‘You know whenever we bring our wives all they want to do is talk about shopping, and you know we need to talk about business,’” Judge Trauger said. “So women lawyers are going to be talking about shopping instead of business? !” she remembers thinking. For her part, Chancellor Martin called to mind how even in the early 1990s some old-fashioned ideas about women were still commonplace in the legal world. She referred specifically to a survey sent out to judges around that time asking if they thought women litigators should be able to wear pants in court. After exploring some of the headwinds that Justice Ginsburg faced in the early stages of her career, the film progressed into a survey of her pioneering achievements for gender equality in the 1970s, which included her successful arguments in cases like Frontiero v. Richardson and Weinberger v. Wiesenfeld. In the latter case, Justice Ginsburg famously argued in favor of a widower who was seeking Social Security survivors benefits to help him raise his young son. At that time, those benefits were not offered to men upon the death of a spouse. “His case was the perfect example of how gender-based discrimination hurt everyone,” Justice Ginsburg said in the film. Justice Clark was particularly impressed with the way that Justice Ginsburg would meticulously prepare her arguments to appeal as much as possible to a given audience. “What she was so good at that I don’t see lawyers always being good at today was studying her audience in advance, knowing everything about those judges that she could, and coming in with a plan about how to open their eyes, how to make them listen; how to start with a punch line on the front end that will make you understand this is important and allow you to just listen to what she has to say,” Justice Clark said. Of course, Justice Ginsburg’s courtroom successes raised her profile and helped jumpstart her judicial career, which began in 1980 when she was appointed to the United States Court of Appeals by President Jimmy Carter. She would move on to the United States Supreme Court in 1993 during the administration of President Bill Clinton. Since ascending to the nation’s highest court, Justice Ginsburg has come to inhabit a place in the popular imagination unusual for Supreme Court justices. Judge Newbern alluded to this fact near the beginning of the CLE. The panel grappled with the consequences of that popularity, wondering if it is beneficial for judges to inhabit such roles in American culture. While Judge McMullen disparaged the type of judicial celebrity created by daytime judge television shows, she pointed out one way in which she believes that popularity like Justice Ginsburg’s can be beneficial. Judge Trauger worried about the unintended consequences of elevating judges to cultural-phenom status in an age of increased partisan polarization. Justice Clark shared Judge Trauger’s ambivalence on the subject, contemplating what happens to public perceptions of the judiciary when judges are thrust into the spotlight. “When judges become stars in their own right, and the focus is on them and not on the opinions they are writing, then I think it can detract from the serious nature of what they do,” she said. That is especially concerning since she believes that people grow up in this country without a deep understanding of the judicial branch’s role in government. Justice Clark concluded the event, though, not with any warnings about the pitfalls of appellate superstardom, but with an earnest tribute to the profession that she, like Justice Ginsburg before her, chose to pursue. From left, Davidson County Chancellor Anne C. Martin, United States District Court Judge Aleta A. Trauger, Tennessee Supreme Court Justice Cornelia A. Clark, Tennessee Court of Criminal Appeals Judge Camille R. McMullen, and Federal Magistrate Judge Alistair E. Newbern take part in a panel discussion on the career and legacy of United States Supreme Court Justice Ruth Bader Ginsburg.